Under the shell Xiaomi Redmi Note 4 powered by 2.1GHz MediaTek Helio X20 MT6797 processor with 2GB RAM for multitasking. For multimedia files, the phone comes with 16GB of internal storage (expanded up to 128GB via a microSD card- Hybrid). 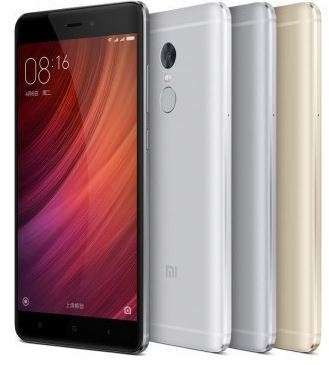 For photography, the little camera of Xiaomi Redmi Note possesses the capability of 13-megapixels (rear) and 5 megapixels (front) for selfies. The battery is the most plus point of this which is 4100mAh non-removable. It can give almost full day backup on fair usage. About the OS, it features MIUI 8.0 runs on top of Android 6.0 Marshmallow. For connectivity, it has all mediums: Wifi, Bluetooth,Wifi direct hotspot, 2G, 3G, 4G LTE supports all Indian telecom bands. Plus the IR blaster which was also available in Redmi Note 3 can be very useful to control different infrared devices and gadgets. The sensor that includes in mobile are Proximity sensor, Ambient light sensor, Accelerometer, and Gyroscope. So in Redmi note 4 you will not be going to find any huge difference in design perspective if you are a user of Redmi note 3. But specs wise it has improved performance and MIUI. We will give you complete performance review of Redmi note 3 when it launch.